We would be happy to welcome you into our guesthouse. Our restaurant can seat approx. 100 people. 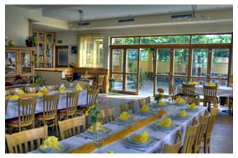 We are also happy to cater for events ( confirmations, weddings, first communions, christenings, birthdays, engagements). We also are open to bookings from coach parties and can present a range of different group offerings. From Wednesday to Friday we offer 2 daily menus per day, as well as a weekend menu on the Sunday. We offer various dishes on the menu: pork, beef, poultry, lamb and fish, as well as vegetarian meals and game dishes when in season. We also offer products to take away, such as, by way of example, a selection of homemade marmelades and jams.